This modern dress from Annalee + Hope features no lining, pull over style, back button closure with keyhole, cold shoulder cutouts, elbow length sleeves, fuchsia contrast trim, shift silhouette, and jersey stretch fabric. Annalee & Hope offers casual perfection without sacrificing style. 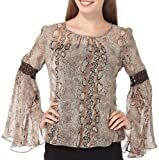 Funand trendy this short sleeve top mixes a floral lace design with a polka dot print. Nylon/Spandex.